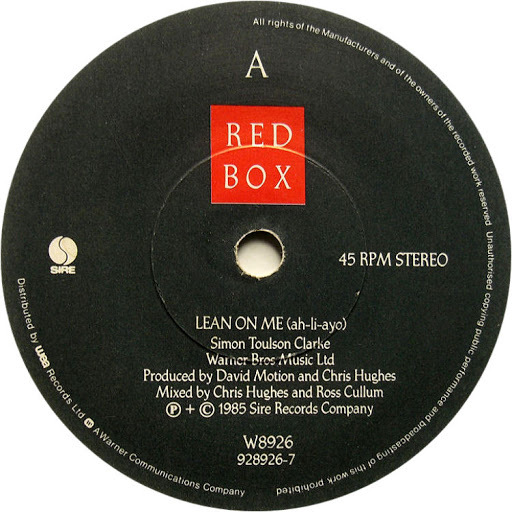 This week Michael has sent me a song from 1985 called “Lean On Me (Ah-Li-Ayo)”, by British band Red Box. It’s not a cover of this. Michael chose it because the chorus was “so addictive”. We’ll see about that. 0:00-0:11 – Synthesizer set to “Ice Crystals”. No thanks. 0:11-0:28 – Wow, that’s a simple-minded tune. And I don’t mean it sounds like Simple Minds. I mean it’s more like something you’d hear in a playground. 0:39-0:44 – “Men on fire pray for rain.” I dare say they would. 0:44-0:49 – “Who are madmen, who is sane?” That’s a tricky one. 0:49-0:50 – That’s a cute little tune from the synthesizer. 0:50-0:53 – I think this is the chorus. 0:53-0:56 – Whoah! Where did all those people come from? 0:56-1:01 – OK. Now the drums are playing a regular beat instead of that dreamy, half-time stuff it was doing up until here. I’ve only just noticed all the percussion going in this part of the song. I think it’s well done, and enhancing the track. 1:01-1:21 – Ah. This is the chorus. Oo-er. A little metaphorical light bulb has gone off in my mind. I’ve heard this song before. None of this song sounded familiar until that chorus bounded into my mind saying, “Remember this catchy, catchy thing?”, to which my brain replied “I do indeed”. What is that sound at 1:12? Did a human make that sound, or was someone fiddling about with a synthesizer? 1:21-2:00 – And now we’re in the next verse. I was surprised at how abrupt that transition was. The choir has decide to join in during this verse, with a little “Yeah yeah” (1:26), followed by all the singers cheerfully echoing the lead singer’s “Are we shouting, ever heard?” (1:27-1:31). In response to all the singers: yes, I can hear you loud and clear. I also had no problem hearing you all shouted, “Well, can we have a say?” (1:52-1:54). 2:00-2:42 – Here’s the second chorus, and I’m afraid the opening line (“From the very, very young to the very, very old…”) is getting stuck in my head. I don’t really want it stuck in my head. OK. Now it’s back to the Red Box song. 2:42-2:52 – A little instrumental interlude that reminds me of “Merry Christmas Mr. Lawrence” (1983). That is now stuck in my head. 3:41-4:16 – An elaborate (lead-singer-less) verse. I thought the band were going pummel me with extra choruses, to really ram that tune into my head so it wouldn’t go away. I must admit that the experience of hearing that song again was nowhere near as distressing as I thought it was going to be. Thanks, Michael, for reminding me of a song that nobody seems to be interested in playing anywhere in public* anymore. You are currently browsing the archives for the Red Box category.